2008 | To Be, To Be. Tutubi. We had our buffet lunch at Loboc's Rio Verde Floating Resto. We missed the first boat and had to wait for the next one. This boat was reserved for Cesar Montano, Sunshine Cruz, Rico J. Puno and party. They were accompanied by the mayor, and a lot of Loboc local officials. Rumor has it the he will run for Governor in the next election. Oh, is that why bati na sila ni Shine? he he, tsismis. This is our cozy boat, which had 5 tables only. There was an Ati community at the end of the river and we stopped by for some pictures. Below is Rico J. Puno who had a concert in Baclayon Church for the December 8 town fiesta. The river was so beautiful and the cruise so relaxing. The food was very good also. Our singer was very entertaining and the other tourists were all singing with him and requesting songs and just thoroughly enjoying themselves. How was the cruise, just look at my kids! Our next stop was the home of the 23-foot Phyton, named Prony. Can you see the picture below? It was fed a pig, a whole pig! This is Marimar, the tour guide. He said they feed the snake once a month, either with a pig or goat. My husband and Drexelle said he look like a cross between Michael V and Ogie Alcasid. Our next stop was the Baclayon, a church made of stone corals. For more information, read this. Our last stop for the day was the Blood Compact Site located in Bool, Tagbilaran City. The sculpture was made by National Artist Napoleon Abueva. While we were there, one tourist went up to whisper to wish inside the cup, so we followed suit. He he, suckers. Aside from the rich history, the Blood Compact site has a very beautiful view. 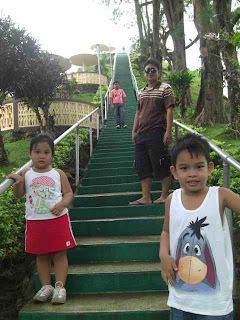 As a review, we were able to visit the Cholocate Hills, the Billar Man-Made Mahogany Forest, tasted the local delicacy Alupi, the hanging bridge in Sevilla, Loboc River, saw bolo making and nipa weaving, saw the Tarsiers and the Phyton, the Baclayon Church, the souvenir shops (no photo, left at the van) and the Blood Compact site. Yep, 11 sites in all. 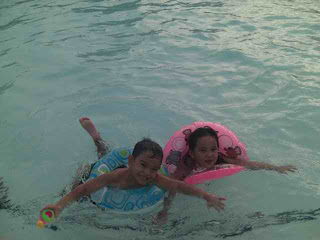 We were at the resort by six pm. And guess what? While me and my husband were dead tired already, the kids still begged for a swim at the pool and had to be threatened with bodily harm to leave the pool by 9pm! We still had to wake up at 5 for our sea tour! More of the sea tour on next entries! 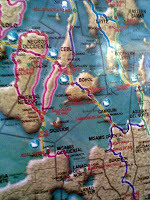 Our second day is the Great Bohol Land Tour, promising some 11 sites/spots. Call time was at 9am, and we were in Carmen by 1030am. 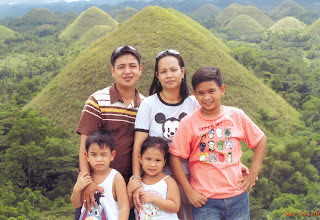 It was raining on the way there but has thankfully stopped once we reached the Chocolate Hills in Carmen. And the view, W-O-W! Though the hills are green and not chocolate-y, they were very beautiful! You can imagine how they look like come summer. We had lots of fun posing for photos and here are some of them. These were taken by the photographers there. After taking some 300 photos (he he, adik! 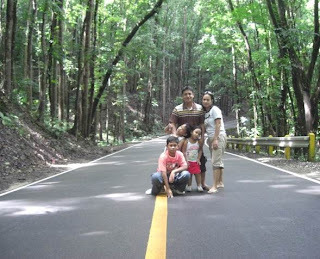 ), we were on our way back to Loboc. We stopped by a church and our driver slash tour guide bought a native delicacy called Alupi. It was like suman, and has coconut strips. I forgot what else it was made of as we were so busy eating. 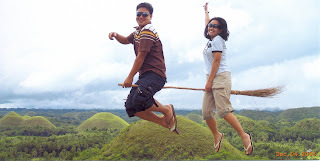 Sayang, we didn't get to buy any for pasalubong because we were still busy talking about the awesome Chocolate Hills and we were trying to reach the Loboc river in time for lunch. We also passed by the Hanging Bridge in Sevilla. 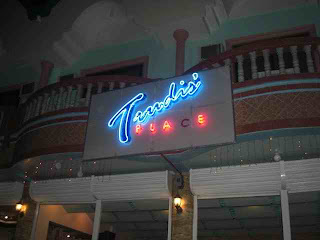 At the other side were souvenir shops where you can get tarsier items for very cheap prices. Watch out for The Great Loboc River Cruise. 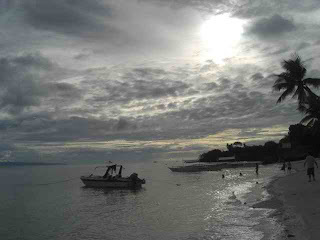 We were in Bohol from December 3-9 and boy, did we enjoy it! 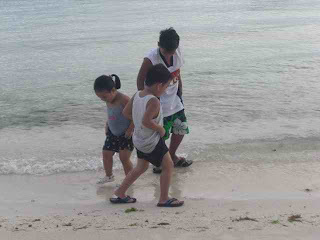 It was our first time to travel alone, as a family, without the usual extended family members or friends. It was also the first plane ride for my kids. Ishi was afraid at first, complete with a trembling chin and teary eyes, but later on was very happy to be up there on the clouds. They just complained of a little pain in the ears which disappeared later on. We arrived at the Bohol Divers Resort ( I got a package from Tata Rabe, she is a very accommodating lady and will give you a package that will suit you, contact her at tatarabe@yahoo.com) at around 4pm. Our room was at the other side of the resort, with a garden view and 2 minutes walk to the beach and 5 minutes walk to the big swimming pool. The walk was really a good thing since it helped us burn the food, he he. We immediately went to check the beach and we were not disappointed! 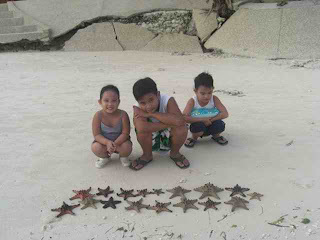 A girl brought these starfish for us to enjoy and we happily pose for pictures. After the kids had a blast enjoying the water, we headed back to our room and change for a dip at the big, shallow pool, which we had all for ourselves. When the kids got hungry, we changed for dinner and headed back to the beach in search of the famous Trudis Place. 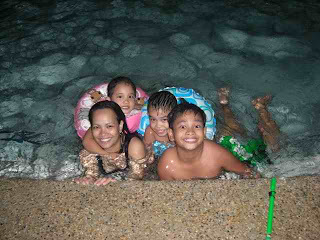 After a delicious dinner, we had pork sinigang and fried chicken, but no pictures since we were all very hungry by then, we head back to the resort, changed again to our swimwears and went back to the pool. At around 9 pm, the kids were finally willing to go to bed, tired but eager for the next day of adventure! 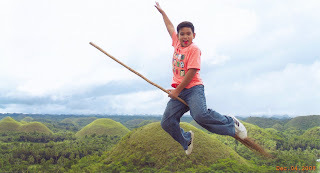 Watch out for Day 2, The Great Bohol Land Tour.